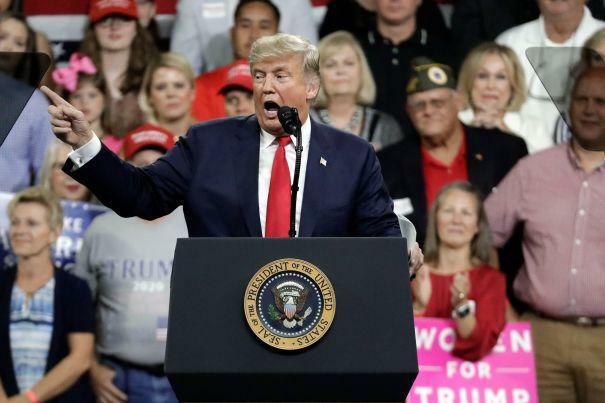 Trump: "Angry Mob" of "Radical Democrats" Has Become "Too Extreme And Too Dangerous To Govern"
President Trump on Saturday touted a conservative victory after his Supreme Court nominee, Brett Kavanaugh, was confirmed as the 114th Justice after a contentious and dramatic assault from the left. Speaking in Topeka, Kansas, Trump framed the Democratic resistance to Kavanaugh as an attempt by an "angry mob" to hijack the proceedings "in their quest for power." "They threw away and threw aside every notion of fairness, of justice, of decency and of due process," Trump said of the anti-Kavanaugh efforts. "What he and his wonderful family endured at the hands of Democrats is unthinkable, unthinkable." "Just imagine the devastation they would cause if they of their obtained the power they so desperately want and crave," Trump added. "You don’t hand matches to an arsonist and you don’t give power to an angry left-wing mob, and that’s what they have become." "You have to vote," Trump insisted. "On November 6 you will have the chance to stop the radical Democrats — and that’s what they have become — by electing a Republican House and a Republican Senate. We will increase our majorities. We need more Republicans. We need more Republicans." "The Democrats have become too extreme and too dangerous to govern," Trump continued. "Republicans believe in the rule of law not the rule of the mob."